The following example illustrates the polarization behavior of carbon steel in a deaerated solution (oxygen removed by purging with nitrogen for example) maintained at 25oC and a pH of zero. 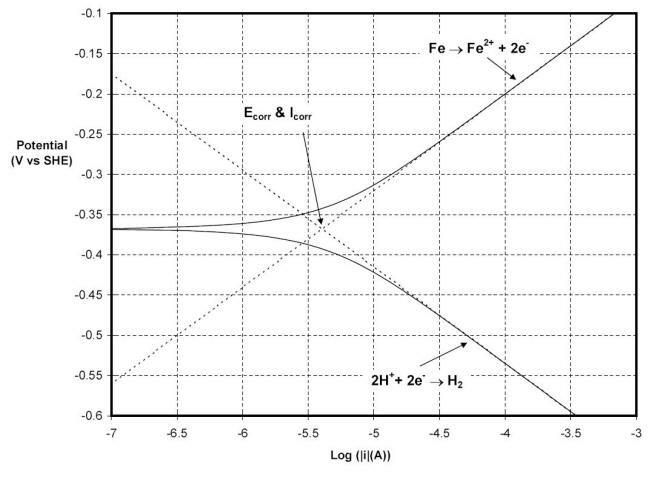 The solid line in the following Figure is the polarization plot itself and the dotted lines in this figure represent the anodic reaction and the cathodic reaction that explain the corrosion behavior of steel in these conditions. These lines are extrapolated from the linear sections of the plot on either the anodic or cathodic sides of the curve. While it is relatively easy to estimate the corrosion potential (Ecorr) from the sharp peak observed at -0.221 V vs SHE, when the current crosses zero (infinity on a log scale), the projected dotted lines are required to find the intercept indicating the specific point on the chart where the cathodic and anodic currents cancel each other. The corrosion current density (icorr) can be obtained by dividing the anodic current by the surface area of the specimen, one cm2 in the present case. According to our conversion scheme the current density of 67 mA cm-2 evaluated in this example corresponds to a penetration rate of 0.8 mm y-1. The second example represents the carbon steel polarization behavior when exposed to a deaerated solution maintained at 25oC and pH of five. The mixed potential diagram of this system is shown in the following Figure. 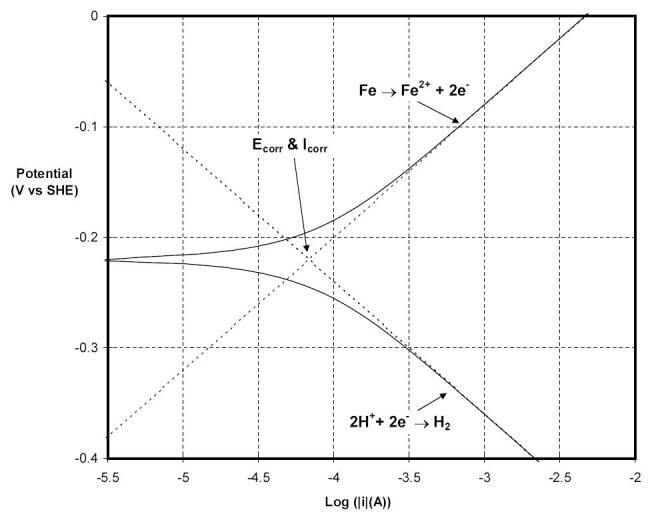 The Ecorr in this example has shifted to a more negative value of -0.368 V vs SHE and the modeled projected lines provides an estimate of the corrosion current density of 4 mA cm-2 that translates into a penetration rate of 0.05 mm y-1.